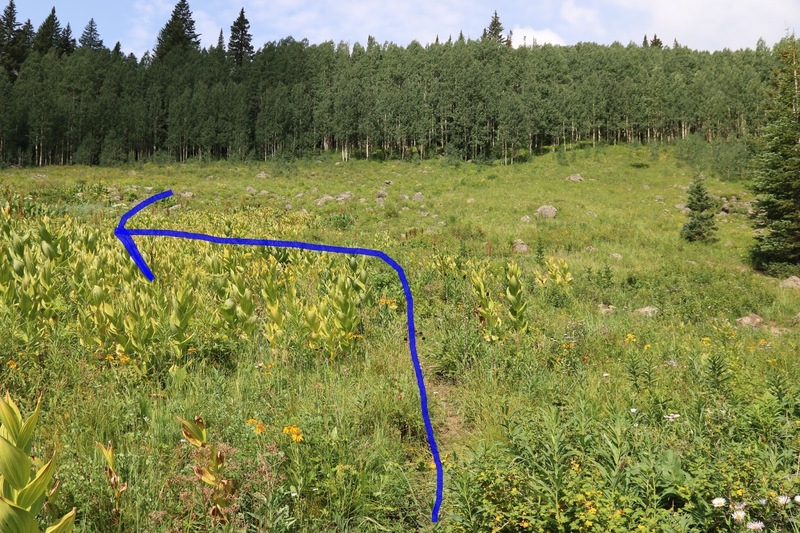 The Beaver Creek trial is located in the White River National Forest just south of Rifle, Colorado. 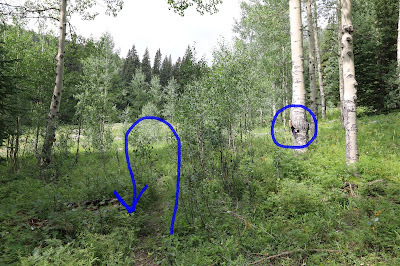 The trail begins off of the Beaver Creek Road, Forest Service Road 824, where after crossing Beaver Creek it climbs through a forest of aspens to a ridge. After following the ridge for a short distance the trail wraps around the mountain and continues climbing the Beaver Creek drainage while overlooking the Teepee Park area. Shortly after being connected to by a spur trail that leads to Brush Creek the Beaver Creek trail meets up with the Cache Creek trail and comes to an end. To get to the trailhead take Exit 90 on Interstate 70 and head south. At the second roundabout turn west onto 7th Street. After a short distance 7th Street will turn south onto Garden Lane which will turn right and become County Road 320, the Rifle-Rulison Road. Follow County Road 320 for 2 miles and turn left onto County Road 317, the Beaver Creek Road. There will be a brown National Forest Access sign at the turnoff. Stay on County Road 317 for 5.6 miles where it will cross a cattleguard and enter the White River National Forest. At that point the road becomes Forest Road #824. After about 0.6 miles FR #824 will pass what looks like a trailhead. 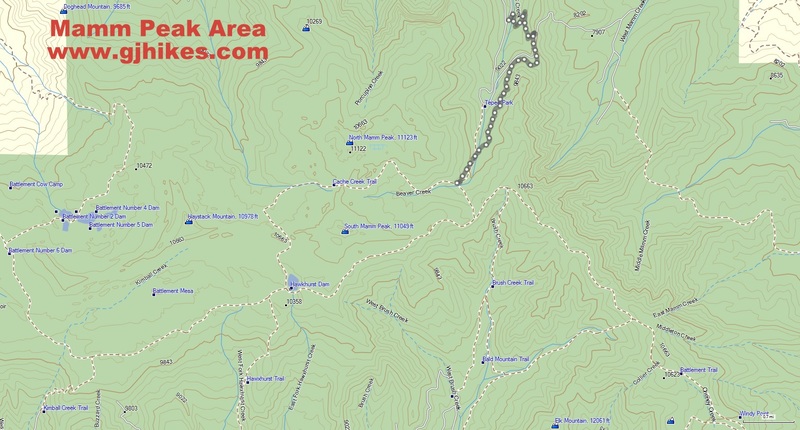 There will be a sign that says that the Beaver Creek trailhead is 1 mile ahead. After continuing for another mile there will be an unmarked pull off on the left that is large enough for about 3 vehicles. Shortly past the pull off there is a locked red gate. After parking you will find the trail by walking back down the road 20 or 30 feet. There is a brown mylar trail marker with 2164 on it that is obscured from view by the tall grass around it. A little further away from the road is another sign that says 'Rifle Drinking Water Protection Area'. As it starts out the trail angles away from the road and comes to a creek crossing. After crossing the creek the trail widens as it turns back in the other direction and begins gradually climbing. 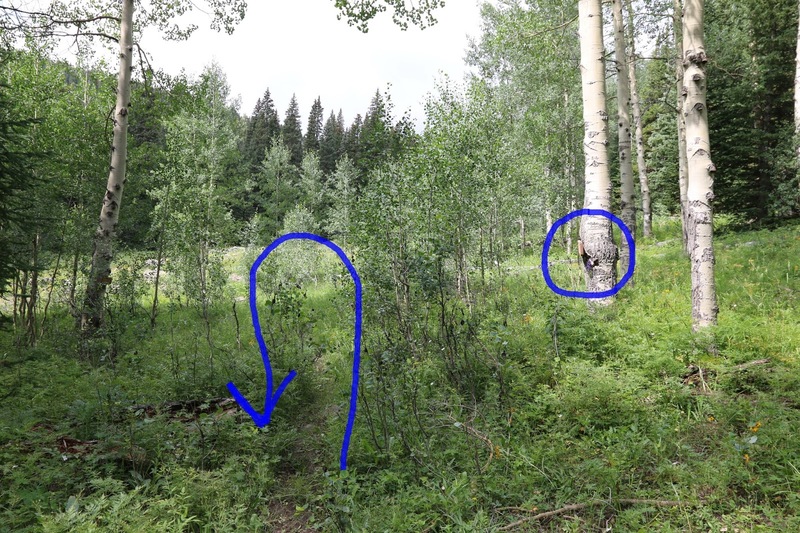 The trees transition to mostly aspens the higher the trail gets. Near the 1.1 mile point the trail reaches a ridge and turns to the right. Currently there are no trail markers at this trail junction. For the next half mile or so the trail follows the ridge. When it gets close to the hill in this photo the trail turns and begins wrapping around the right side of it. As the trail wraps around the side of the mountain it passes through some nice patches of raspberries. The trail keeps climbing at a comfortable pace as it works its way up the drainage above Teepee Park. The trail gets a little rocky after the 3 mile point and before long it ends up crossing back to the other side of the creek. There is a brown mylar trail marker on the other side of the creek. After crossing the creek the trail starts heading uphill a little where it gets lost in a field of wildflowers and skunk cabbage. As it comes to some rocks that are cropping out from the hill it turns sharply to the left and passes through a patch of twin berries. For the next 50 feet or so you have to walk by faith until the trail begins to reappear. 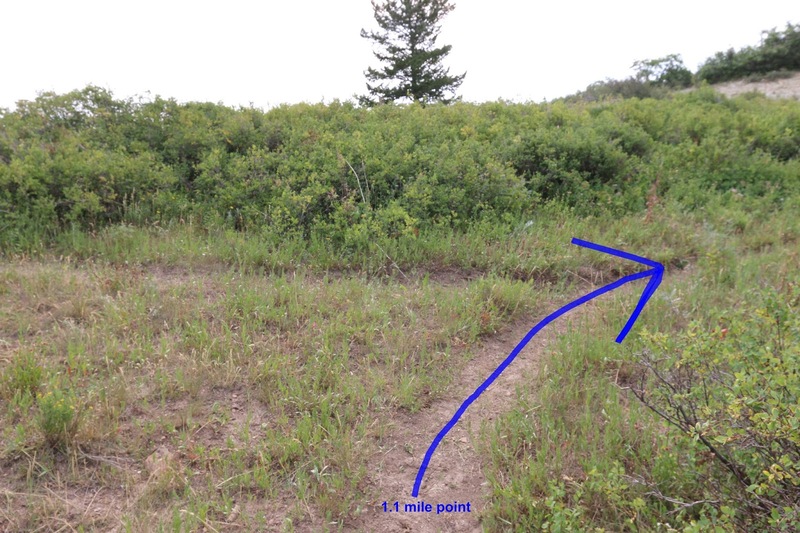 If the well worn trail isn't obvious then walk around the edge of the clearing until you find it. Once it appears there is no mistaking it. The last part of the trail becomes fairly pleasant. Near the end it will pass a sign for the Brush Creek trail that is grown over by the trunk of an aspen tree. About 200 feet past that there is another sign that is a little off to the right of the trail that marks the end of the Beaver Creek trail and the start of the Cache Creek trail. This was the turnaround point for this post. 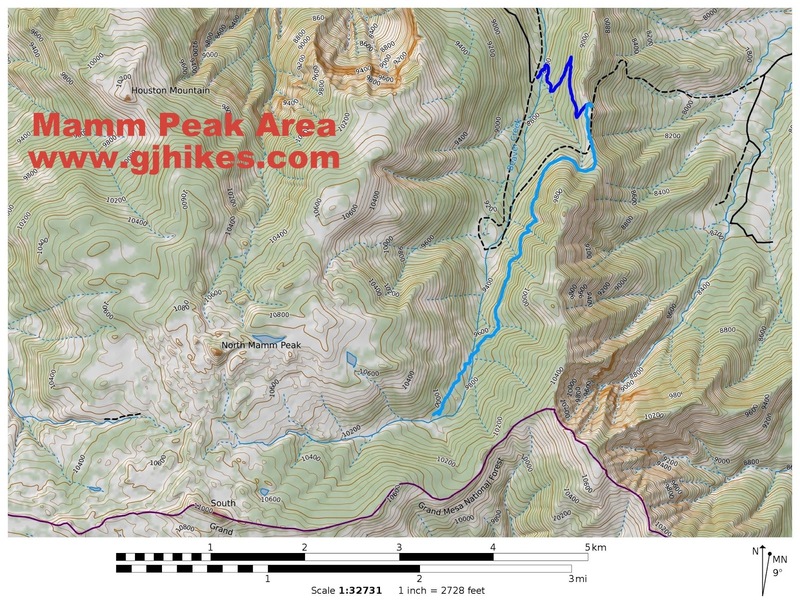 Before heading back one option is to hike up the Cache Creek trail for a little over 1 mile and bag North Mamm Peak (11,123 feet). By the time we got back down the trail several others had shown up. We could tell that the trail was getting a little use because it was well maintained. 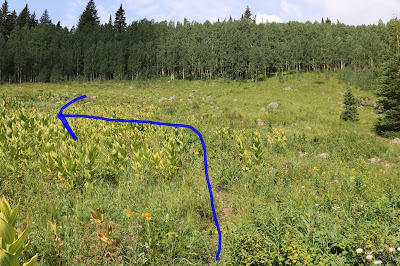 There were a couple of spots where another trail marker would be helpful like at the top of the first ridge so that you would know to go to the right and at the meadow of skunk cabbage. 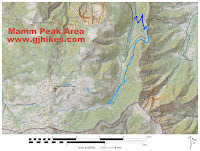 We were carrying a couple of maps so we were able to figure out which way to go by studying the contour lines and such. All in all the Beaver Creek trail was a nice escape from the summer heat in the lower elevations. If you would like to see it for yourself then all you have to do is 'Take a hike'.